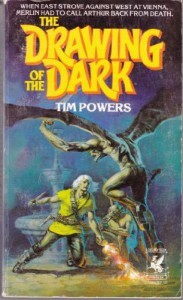 Man, Tim Powers is cool. He does this "secret history" thing, where he's almost writing historical fiction but the blanks in the historical record he fills in with fantasy elements. It really works. It helps a lot that the historical aspects of his stories are really well researched. I guess that's a pretty important part of writing historical fiction, and it's something that I know a good number of historical fiction authors pride themselves upon, but I find it especially impressive in the case of Powers because he's not writing straight historical fiction and could probably get away with quite a bit more historical inaccuracy. It's clear, though, that to Powers cleaving closely to actual historical events is what makes his stories come to life. I've only read two of his novels (so far), but I'd say he's definitely made the historical periods in those books (this one and On Stranger Tides) live and breathe, enough that after reading the books I spent hours reading about the periods he merely used as backdrops! The setting for this novel is the 1529 Siege of Vienna by the Ottoman Empire, but Powers' focus is on his main character, an aged Irish mercenary named Brian Duffy, and on the supernatural elements of the story, and there are quite a number of those. I mean, here we have Merlin, Arthur, the Fisher King, ifrits, dwarves, flaming swords, Ragnarok, Finn Mac Cool, Bacchus, and most importantly, magic beer. Yes, magic beer will save the Western world from the invading Turks. Now, put like that, the novel sounds quite ridiculous, but it's truly a testament to Powers' skill as a writer that when you actually read the book he makes it all sound fairly reasonable and not ridiculous at all. My one gripe with this otherwise fine novel is actually a fairly major one, and that is that the entire premise of the book has a distinct cultural bias. Powers has Merlin explicitly state at one point that because he was Baptized, he fights for the Western world, whereas Ibrahim, even though an ethnic Greek, fights for the East due to the fact that he has embraced the Islamic faith. There's a subtle glorification of the Western world and an equally subtle vilification of the Eastern world which pervades the book, and I found it a little off-putting. Granted, the novel was published in 1979 and was one of the earliest books Powers wrote, but these types of attitudes do serve to date the works which present them, and as good as this book is, it did suffer a bit from an us versus them mentality. However, if fans of fantasy were to completely avoid all stories which bear troublesome philosophies, there would be precious little pre-1990 stuff for us to read. My recommendation is to enjoy this novel for what it is: a well-written, action packed historical fantasy with few weaknesses.